Here is an amazing assortment from my personal collection of Josefina Aguilar clay figures for sale. Josefina is from Ocotlan, Oaxaca, and creates clay sculptures in herr home pottery studio on the road leading into town. She is famed for her whimsical interpretation of the world, including the life of Frida Kahlo. I also have a few pieces for sale by her sister Guillermina, equally talented who lives right next door. What’s amazing is that I got all these back to the U.S. intact, whole, with no cracks or broken pieces! 1. 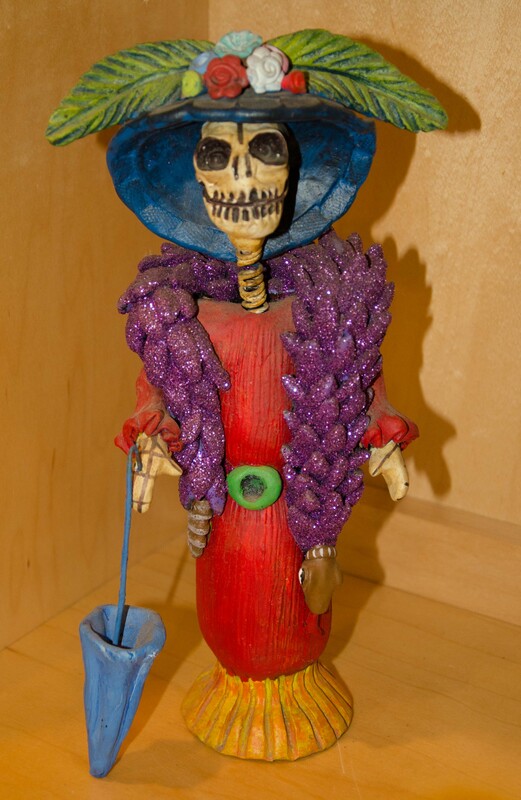 Calavera Lady with Purple Boa. $165. Signed Josefina Aguilar. She stands almost 12″ high. Blue umbrella is attached. The boa is a series of purple glittery petals, and the detail work is extraordinary. In perfect collectible condition. Price does not include shipping or insurance. It includes excellent packing. 2. 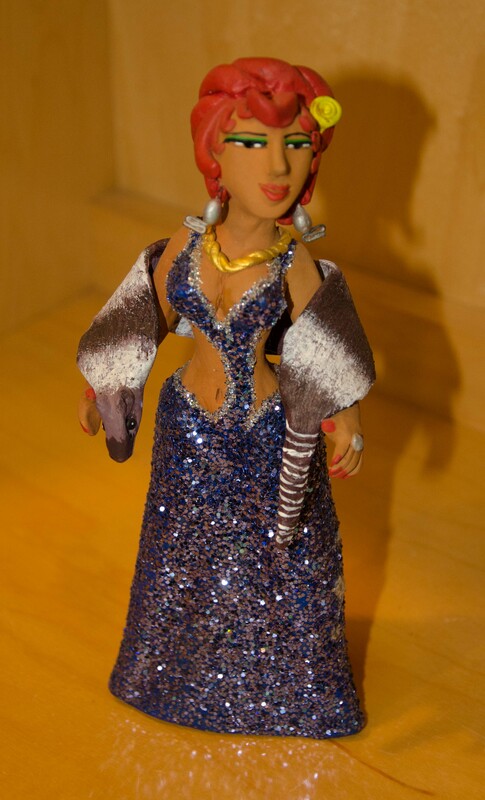 To the right, Foxy Lady of the Night with Glitter Dress and Red Hair. $95. Signed Josefina Aguilar. She is wearing a fox boa — indeed you can see the fox head and tail! Her fingernails are painted bright red to match her hair. The glitter is shimmering purple, and she sports a yellow flower in her hair. Price does not include shipping or insurance. It does include excellent packing. 3. Serene Woman with Flowers and Bowl on Her Head. $95. Signed G.A.A. (Guillermina Aguilar). Stands almost 13″ high. Stunning sculptural figure in natural clay, unpainted, holding a water bowl on her head. The bowl is filagreed and is balanced and held on the head by two metal prongs that protrude from the clay braid. 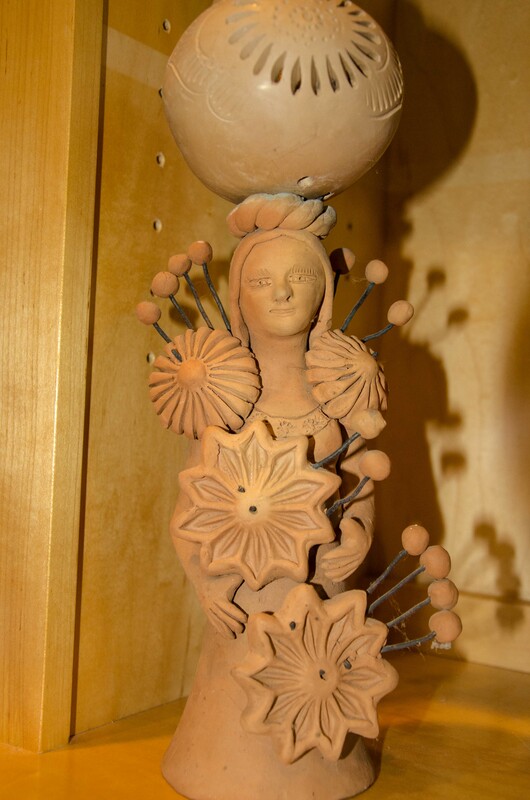 The flowers and stars that decorate her body are also solidly held by metal rods that are baked into the clay. Price does not include shipping or insurance. It does include packing. 4. Day of the Dead Calavera with Flowers and Bowl, $50. Signed G.A.A. 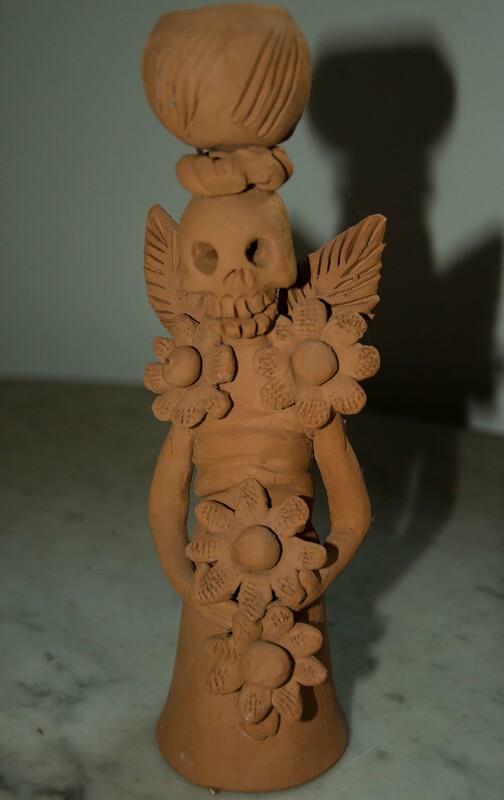 (Guillermina Aguilar) 9-1/2″ tall in natural clay. That bowl rests securely on her head. She is a wonderful representation of the lightheartedness by which Oaxacans celebrate this October holiday — with marigold flowers, lots of good food and fond memories of their departed loved ones. Price includes packing. Does not include shipping or insurance. 5. Frida Kahlo with Three Monkeys. $60. Josefina Aguilar. I loved the sculptural quality of this piece which is why I bought it at Josefina’s studio before she painted and signed it. Any collector would recognize it as pure Josefina just by the sculpting of the nose! 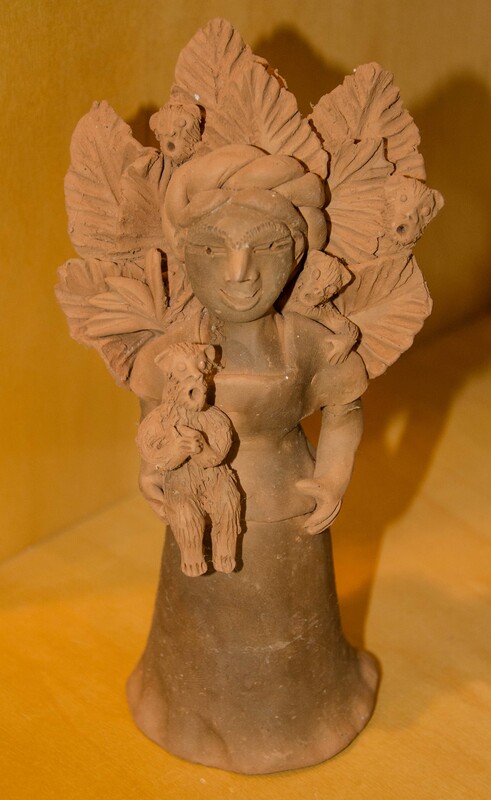 You can see how she attaches the pieces of the leaves and monkeys to the body with slip clay because this is a different color from the clay body. Price includes packing. It does not include shipping or insurance. Please send me an email to let me know you want a piece BEFORE you make a PayPal payment. Include your shipping address and let me know if you want insurance. I will confirm it is still available and send you an invoice based on your location and desire for insurance. Thank you. This entry was posted in Oaxaca Mexico art and culture, Pottery and tagged clay, for sale, Josefina Aguilar, Mexico, Oaxaca, pottery, sculpture. Bookmark the permalink. My mom gave me some Oaxacan clay figures that she got in the 1980’s. There is no signature on them. How can I tell if they are Aguilar? Hi Lyrae. Without a signature it would be hard to identify provenance. Sorry I can’t help. I am interested in buying : 4. Day of the Dead Calavera with Flowers and Bowl, $50. Can you please advise? Thank you. Hi, Lori. I’m sorry. This is no longer available.